all imagery copyright chris straley. Powered by Blogger. This recipe comes from David Lebovitz's newest cookbook, My Paris Kitchen. The only change I made was swapping out chicken stock for vegetable stock to make this dish completely vegetarian. David Lebovitz is an American baker, chef and cookbook author living in Paris, who shares his food and Parisian tales in the most authentic and hilarious way. His memoir, The Sweet Life in Paris, is a favorite and should be read by anyone who has spent any time abroad in Europe. His newest book of recipes and stories is lovely and I have many pages tabbed to make. 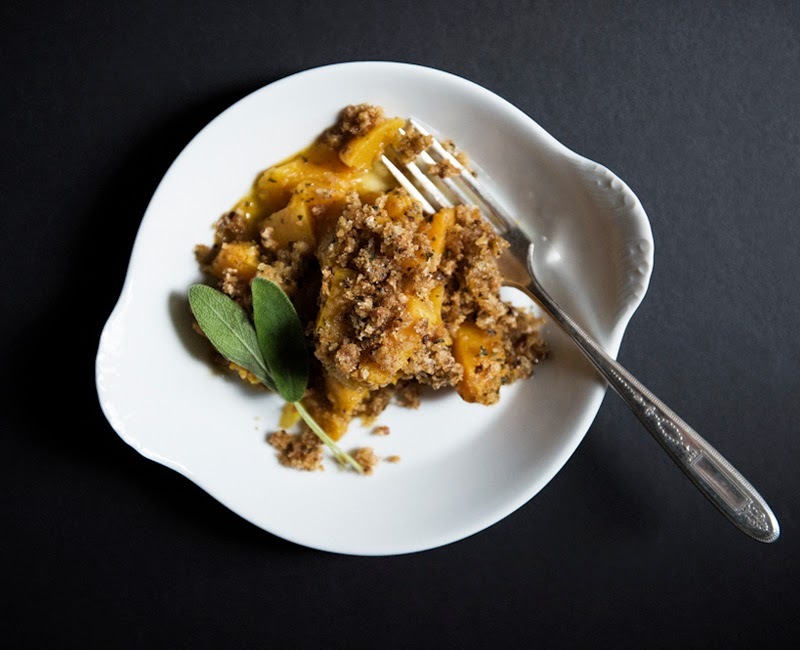 This Butternut Squash Crumble isn't a weeknight throw together type dish. This is something to make when you're in the mood to cook - to peel and chop the squash, to mince the fragrant herbs, to take your time sautéing the shallots and feel the buttery crumb topping in your fingertips. This should be made on a cold Sunday afternoon with a poured glass of wine. 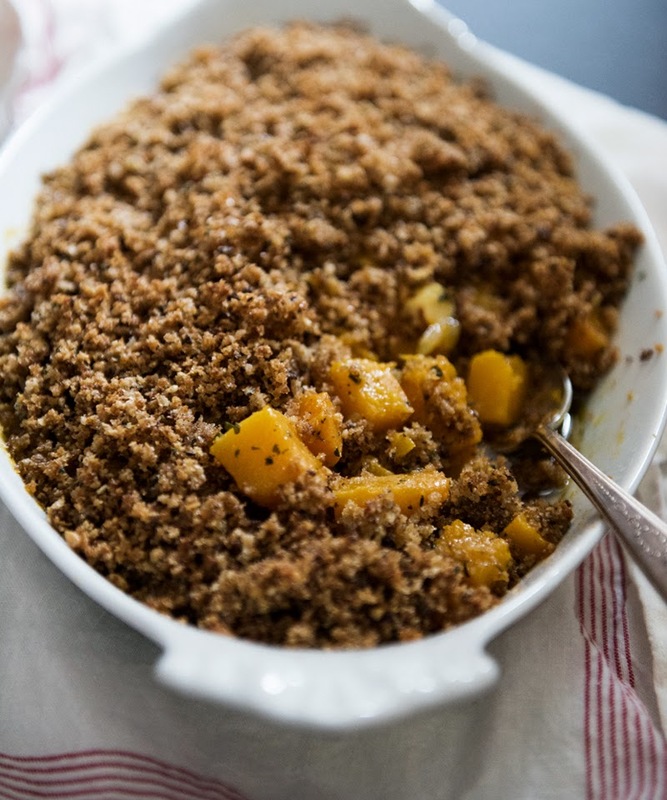 And while normally I pigeonhole butternut squash into the Fall and would say this would make a perfect Thanksgiving dish, and surely it would, I was somehow reminded of a vegetable crumble I had way back when, while on our honeymoon in the dead of winter in Paris. And, well... it just seemed like the right thing to make for this long overdue first food post of the new year. Preheat the oven to 375 degrees F. Generously butter a shallow 3-quart baking dish. To make the squash filling, heat 1 tablespoon of the butter and 1 tablespoon of the oil in a large skillet over medium-high heat. Add half of the squash and half of the thyme. (The filling will need to be made in two batches.) Season with salt and pepper and saute, stirring occasionally, until the squash is evenly browned. Add half of the shallots and cook until soft, 2-3 minutes. Add 1/2 cup of the vegetable broth and cook for 30 seconds while stirring, to reduce the stock and heat everything through. Pour the squash mixture into the prepared baking dish. Wipe the pan clean and repeat the same process with the other half of the ingredients and add to the baking dish. Stir in the flat leaf parsley and use the back of a spoon to spread out into an even layer. Cover with aluminum foil and bake for 30 minutes, or until the squash is soft when pierced with a fork. While the squash is baking, make the topping. Combine the bread crumbs, cornmeal, Parmesan cheese, sage, sugar and salt in large bowl. Use your fingertips or a pastry cutter to mix in the cold butter until well combined. (This process could also be done in a food processor.) Add the egg and mix until the topping mixture just starts clumping together. When the butternut squash is soft, remove from the oven, remove the foil and cover with the topping. Decrease the oven temperature to 350 degrees F and return the dish to the oven. Bake for another 20 minutes, or until the top is golden brown. Let sit 5 minutes, then serve.